The long-range land attack projectile (LRLAP) was developed by Lockheed Martin. U.S. Navy photo illustration. The long-range land attack projectile (LRLAP) has a range of more than 74nmi. Image courtesy of BAE Systems. The long-range land attack projectile (LRLAP) can be fired from the advanced gun system (AGS) of the DDG 1000 Zumwalt-class multi-mission destroyers. 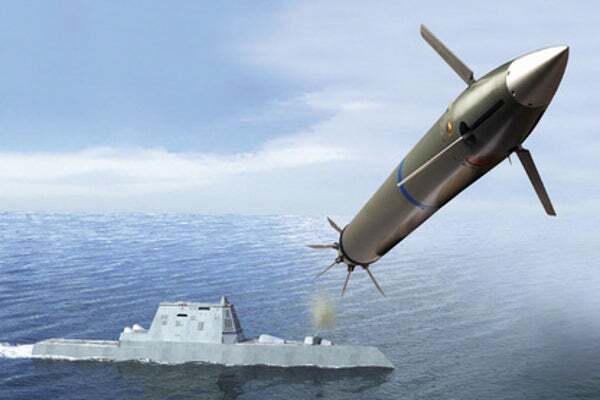 The Long Range Land Attack Projectile (LRLAP) is a 155mm naval projectile system developed by Lockheed Martin for the next-generation DDG 1000 Zumwalt-class destroyers of the US Navy. It is the longest-range projectile of the US Navy. The guided projectile is capable of operating in all weather conditions. It provides off-shore precision fire support from a safe stand-off distance to the troops deployed in expeditionary assault operations conducted ashore by the US Marine Corps (USMC), US Army and Joint / Coalition forces. The National Warhead and Energetic Consortium awarded an $18m contract to Lockheed Martin in September 2013 to commence production of the advanced LRLAP. Lockheed Martin is responsible for the development of production line tooling and test equipment. It will also design process plans for initial production. The guidance and control unit will be assembled at the company’s plant in Ocala, Florida, whereas the final assembly of the projectile will be carried out at Troy plant. The projectile will be deployed on the DDG 1000 destroyer in 2016. The LRLAP can be fired from the Advanced Gun System, which is the primary armament of the DDG 1000 Zumwalt-class multi-mission destroyers. It provides high-degree accuracy for land-attack and naval surface fire support operations. The LRLAP has a range of 74nmi. Aegis Ballistic Missile Defence (BMD) system was developed by the Missile Defence Agency (MDA) in cooperation with the US Navy. The guided projectile is capable of destroying a wide range of enemy targets ashore in a single strike. It is designed with advanced g-hardened electronic components and uses pre-conditioned tactical advanced rocket motor to destroy the target even in difficult gun-launch environment. The projectile has a length of 2.2m, diameter of 155mm and wing span of 0.45m, and weighs 104.3kg. It is fitted with blast fragmentation warhead and height-of-burst or point-detonation fuse. The gun system can fire more than 10 rounds per minute from each of the two gun mounts of the destroyer. The projectile can deliver a unitary high explosive (HE) payload. It is guided by inertial navigation system (INS) / global positioning system (GPS). It can be fired with a near vertical angle of fall to defeat the target with high precision accuracy and low collateral damage. It can provide guidance for several rounds fired from the same gun to destroy single or multiple targets at a time. The US Navy and the DD(X) National Team completed a series of three successful guided-flight tests of the projectile with the Advanced Gun system by June 2005. As the prime contractor for the LRLAP, BAE Systems successfully conducted the first rocket ballistic flight test at Dugway Proving Ground in Utah in September 2010. BAE Systems, in co-operation with its subcontractor Lockheed Martin, completed the first two live-fire tests of the projectile at White Sands Missile Range in New Mexico in August 2011. The third guided gun fire test of the projectile was conducted in October 2012. "It can provide guidance for several rounds fired from the same gun to destroy single or multiple targets at a time." The US Navy successfully conducted four LRLAP guided live-fire flight tests to demonstrate the land-based flight qualification of the projectile during the engineering and manufacturing development (EMD) phase in July 2013. A total of nine tests were completed by September 2013 demonstrating the projectile’s reliability and accuracy, lethality, time of arrival control, and environmental qualification. The Zumwalt class destroyer DDG 1000 is a surface combatant ship designed to operate in a joint maritime fleet to support littoral, air and sub-surface warfare missions ashore. Each destroyer supports the launch of 140 to 160 projectiles in the air at once.